The color on this ZomBean is super weird, right? It was painted using PaintsChainer https://paintschainer.preferred.tech/index_en.html, a program you can use to auto-color your art. Try it out! Despite popular belief, Schererville is not named after me. 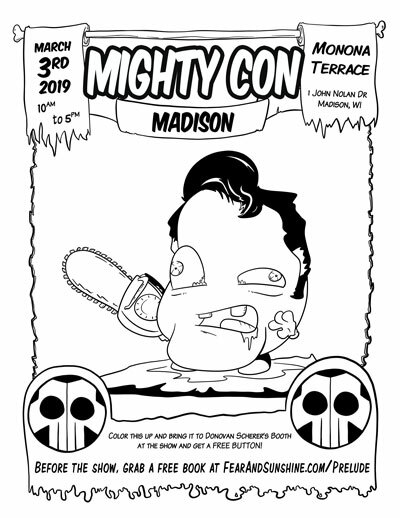 Hello, Wisconsin! We’ve been locked inside for too long. It’s time to come out and play. After this first batch of shows, I’ll be back out at Kenosha Harbor Market every Saturday from the weekend after Memorial Day to the weekend before Labor Day. Then, we’re on the road to Halloween. So, if you need monsters, you know where to find me. You may have seen on my 1000th Instagram post the other day that we’ve got a special announcement. Amazon has set up something big for Studio Moonfall just in time to give a bit of Halloween throughout the upcoming holidays. We’ve got ourselves a new store! 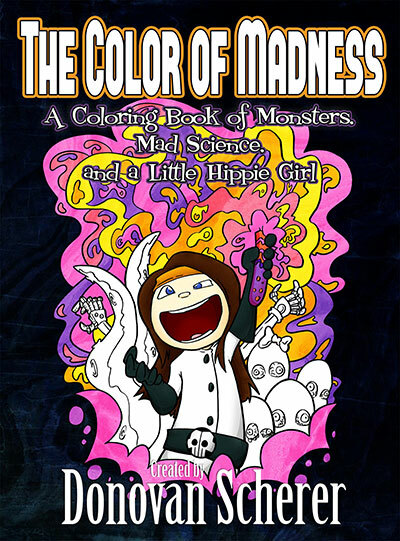 This is a one stop shop for all my monster/mad science/misfit work available on Amazon – print books, ebooks, t-shirts, and pop sockets. While I don’t think I’m any good at promoting my stuff online, I think I did a darn fine job hanging my shingle on the new storefront. 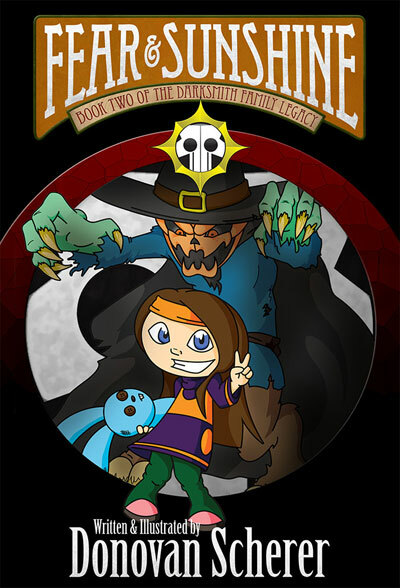 Click here to check out the Studio Moonfall Amazon Shop! The last bits of monster fun this summer! 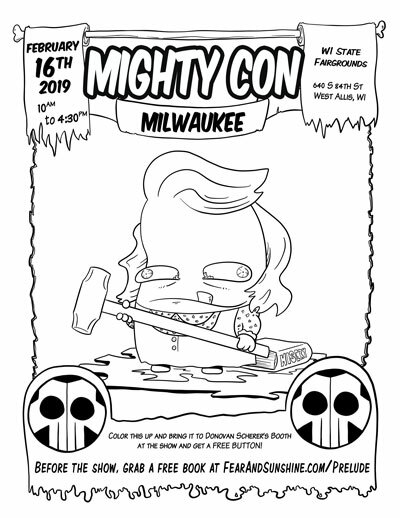 Just a few more shows before Wizard World Chicago so it’s time to stock up before winter comes to eat us all. 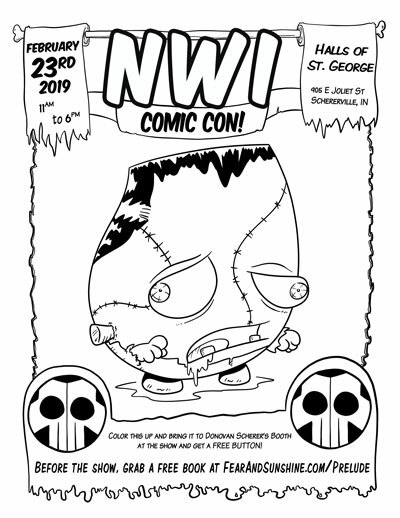 And remember, if you bring a colored flyer or I see you wearing any of my super cool t-shirts at a show, you’ll get a free button. 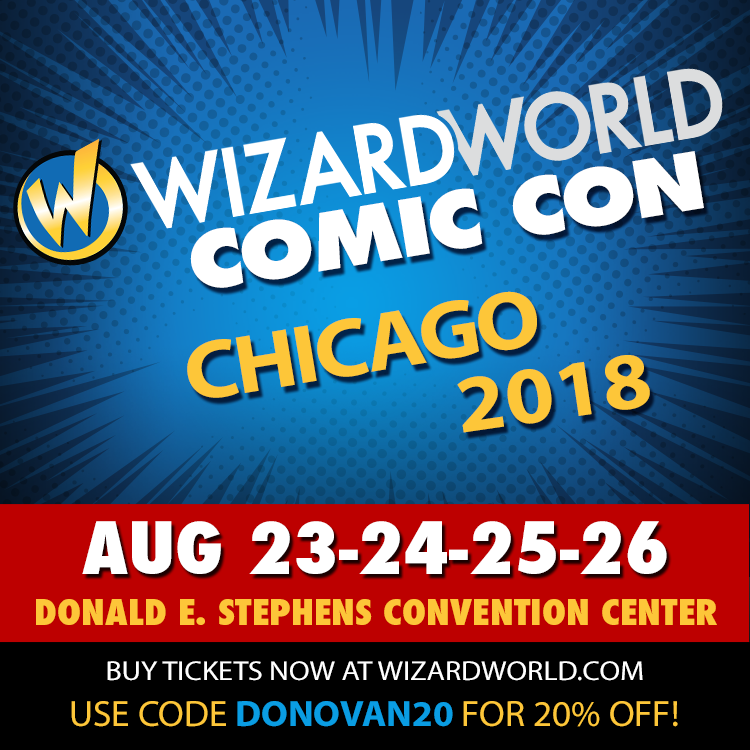 If you’re thinking about going to Wizard World, be sure to use my discount code “DONOVAN20” to save 20% on your ticket. Sunshine Saliente was a carefree girl, happily adventuring into imagination with her stuffed rabbit, seeking make-believe treasure and hiding from storybook monsters, until the day she met a stranger. Fortunately, he was an old family friend. Fear & Sunshine sends Sunshine spiraling into a world of the unknown as she learns of the legacy she left behind and a world she could never imagine that must be saved. 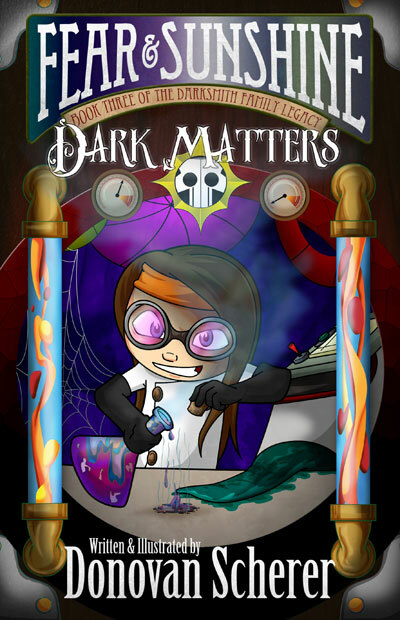 Come along for the ride as this little hippie girl claims her place at Darksmith Manor and meets werewolves, the undead, and the twisted experiments of the mad science dynasty she was destined to lead.